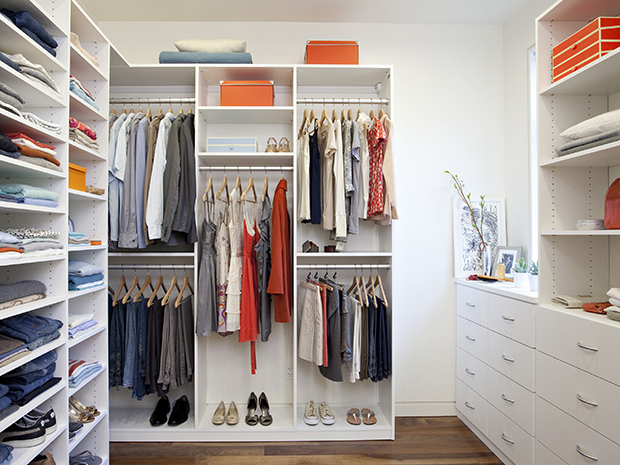 When redesigning your closet, you want to incorporate both organization and design into your thought process. The key to a beautiful closet is one that organizes every article of clothing and accessory you own, while truly reflecting your unique style. The designers from California Closets have been building beautiful custom closets for nearly four decades, and have some suggestions when it comes to beautifully displaying your accessories for homeowners in Collier County, Bradenton, Punta Gorda, Sarasota, Venice, Matlacha, Pine Island or Estero. Below are several unique ways to beautifully display your closet accessories. While you may want some items concealed, there are many items you want displayed. Install open shelving to put your favorite items on display, and take it a step further by installed display LED lighting so that your closet instantly becomes more of a showroom than a place to store your clothes. Storing items on the wall is a great space-saver and organizer as it keeps common items off of the floor for good. Hanging belts, ties, scarves and jewelry will give you a beautiful display while keeping your things organized. Have a shoe collection you want to show off? Get beautiful, customized shoe storage. Choose from an array of configurations and systems, from shoe fences to cubbies to glass shelving to establish the look you want, and one that works perfectly with your collection. If you have precious jewels or heirlooms, it’s best to display and secure it as best as you can. Jewelry drawer dividers showcase your accessories, elevating your morning routine to that of shopping in your own personal boutique. Trays and inserts can be configured in various ways, providing tailored storage, while the lining carefully protects your treasured items. Whatever you envision, you can make a reality with the help of California Closets Ft. Myers-Naples. Visit the Naples showroom or schedule your complimentary in-home expert design consultation to get started today.